Homestyle Rent To Own is a, non franchise, rent to own furniture and appliance store located in Elgin, IL. They offer quality name brands that you know, such as Ashley, Whirlpool, Maytag and others that offer their line of home furnishings in a rent to own model. Homestyle also offers computers, electronics and gaming systems. Homestyle reached out to Severity Design when they had lost their current web designer to a buy out. The previous website they had was not mobile friendly and had actually been taken down by the previous hosting company. They wanted a mobile friendly design, fresh look and some enhanced features so their prospective customers can find them on the web. Severity Design consulted with the owner of Homestyle to find out exactly what their needs are and what could be done within an affordable budget. As a self-owned business, Homestyle also needed additional help with their Facebook page and running email campaigns to their current client base. 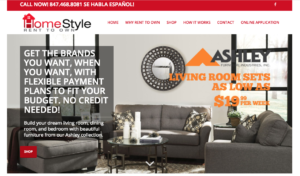 The new Homestyle website featured an attractive automated slider on the home page for seasonal promotions, as well as featuring new additions to their showroom. The website also needed some additional Spanish translation that would enable readability to their demographic and attract the right client base. The most important addition to the new website was the online application form. This application enabled customers to start the pre-approval process by filling out the application online and coming into the store to shop. This allowed the Homestyle staff to be prepared with the required information to approve financing for the customer and gained a commitment from the buyer to come into the store to do their shopping. A win for both Homestyle RTO and the customer!